The Svalbard Global Seed Vault in the Arctic Circle has received a major deposit of nearly 50,000 seed samples from around the world, bringing the total number of seeds stored at the remote facility to nearly one million. This latest deposit—one of the largest ever—is a critical step in ensuring global food security at a time when the world’s climate and geopolitics seems precarious. With contributions from nine different institutions, today’s major deposit is one of the largest since the vault was opened nearly a decade ago. Countries that added seeds to the facility include Benin, India, Pakistan, Lebanon, Morocco, the Netherlands, the US, Mexico, Bosnia and Herzegovina, Belarus, and the UK. The seed samples, which will be stored at the facility for safekeeping, include some of the world’s most vital food sources. Samples of wheat, lentil, barley, cultivated rice, mung beans, chickpeas, sorghum, grass peas, mash beans, and over 86 different potato species are just a handful of the varieties that comprised today’s deposit. This brings the total number of seed samples now stored at the Svalbard Seed Vault to 930,821. Launched in 2008, the facility is managed by the Norwegian government, the Global Crop Diversity Trust, and the Nordic Genetic Resource Center. The seed vault is located 800 miles (1,300 km) north of the Arctic Circle on the Norwegian island of Spitsbergen, and it contains the largest collection of agricultural biodiversity in the world. The Crop Trust funds the preparation and shipment of seeds from developing countries to Svalbard, as well as a portion of the vault’s annual operating costs. The Nordic Genebank (NordGen) oversees the operations of the vault, as well as the online database of samples stored in the facility. Duplicate samples of some of the world’s most important crops are stored within the facility’s cold, dry caverns. The seed vault—embedded within the Arctic permafrost—can store up to 4.5 million samples from around the world. 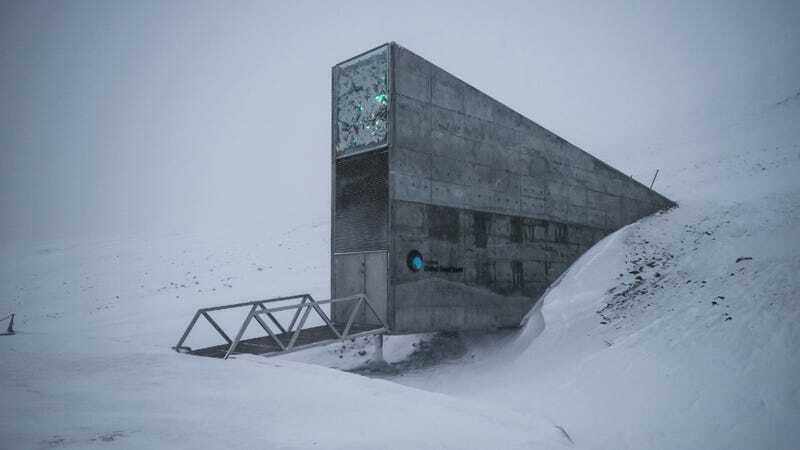 Popularly known as the “Doomsday Vault,” it holds “spare” copies of seeds in the event of local or global-scale crop disasters caused by war, climate change, or natural disasters. Virtually every country is in agreement about conserving crop diversity, as stated by Target 2.5 of the United Nations Sustainable Development Goals, through the establishment of seed collections. “Crop diversity is a fundamental foundation for the end of hunger,” Haga said. Since the facility opened nearly ten years ago, the vault’s contents have steadily increased. As part of the vault’s first anniversary, more than 90,000 food crop seeds were placed into storage, bringing the total number of samples to 400,000. By 2014, the total had reached 820,700. Now the total is just shy of a million, representing well over 4,000 different species. The vault acts as a “black-box” system, meaning that depositors still own and control access to the seeds they deposit. Regional gene banks exist to ensure that seed samples are available to farmers, researchers, and processors in accordance with international regulations. Svalbard has already proven its worth. Back in 2015, when the Syrian Civil War threatened Aleppo, the International Center for Agricultural Research in the Dry Areas (ICARDA) made the first withdrawal of seeds from the Svalbard Seed Vault. ICARDA took the duplicate seeds so it could continue its breeding program in Morocco and Lebanon. Today, after achieving its goals, ICARDA returned a portion of the seeds withdrawn in 2015 to Svalbard. “We are demonstrating today that we can rely on our genebanks and their safety duplications, despite adverse circumstances, so we can get one step closer to a food secure world,” said Aly Abousabaa, the Director General of ICARDA. Sadly, the need for a doomsday vault has never seemed more pressing. Human-caused climate change has prompted fears of megadroughts, massive crop failures, and the return of dust bowls. At the same time, the geopolitical situation around the globe has taken a dramatic turn for the worse. Hopefully we’ll never have the use the Svalbard Seed Vault on a global scale, but it’s good to know this storage facility exists.